I wanted you to have an extraordinary life. Often when I find myself in a reading slump, reading too many academic, heavy books is to blame. When it comes to my favourite authors (ahem, Tolstoy), reading is still a joy, but when it comes to books I need to read for some reason or another, I often end up struggling (the Spanish plays from the 1800s I’m reading for university come to mind). The remedy? An exciting novel I can immerse myself in for a few days. 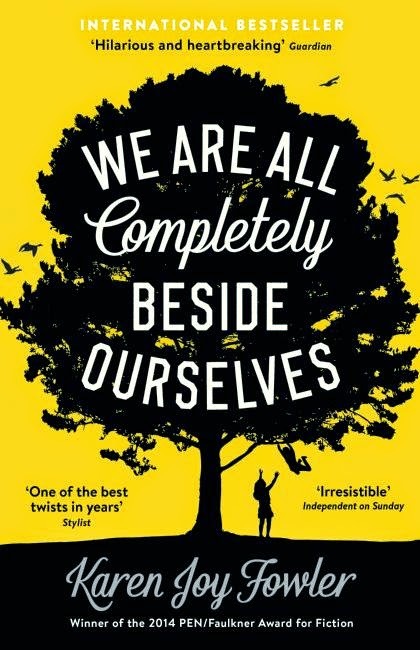 After I kept seeing the bright yellow cover of Karen Joy Fowler’s (Man Booker shortlisted) novel We Are All Completely Beside Ourselves, I wanted to see if this was the book for me to be reading. Although it took me a few weeks to start, when I did, it didn’t take long to finish, and it successfully got me back into reading again – for fun. However, rather surprisingly, the novel was nothing like I thought it would be. I picked up the book because I’d been seeing it everywhere, and I like to give a few novels selected for The Man Booker longlist and shortlist a go. I didn’t know that the author wrote The Jane Austen Book Club, or that she often wrote science fiction or fantasy. Now, if at this stage you are planning to read the novel, and have not read any detailed reviews (as I had not), I’d recommend you approach it blindly. Pick up the book when you have a few hours of uninterrupted reading time, and see what you think of it. You may be put off slightly by the revelation that arises perhaps a third of the way through the book (I must check the accuracy of this), or you might be intrigued. For me it was a mixture of both. The novel quickly became something I could relate to (haven’t most of us with siblings experienced rivalry at some point? ), and I could see some of my own awkwardness yet love for learning in the protagonist, Rosemary. I was keen for this to develop further, but the revelation put a bit of a stop to it. However, the plot turn did make for very interesting reading. I was grappling to understand the implications on the wider plot, which Rosemary in fact decides to start “at the middle”, and my reading pace must have at least doubled at this point. How could the novel possibly end? Regardless of the unexpected big reveal, the central theme I was expected remained: family. There are countless relationships and friendships at work in this novel, and none remain static. The oft-quoted first lines from Anna Karenina (more on Bartlett’s new translation next week) that “All happy families are alike; each unhappy family is unhappy in its own way” comes to mind here, and Tolstoy surfaces at various stages in the novel. Keep a look out for these! However, it’s a very individual, yet relatable, depiction of family life. Rosemary struggles to find her place in her family, but does reach a sense of clarity, identity and purpose in the novel’s closing pages. Read it and have a think about your own life and ties to others. One day I found a note he’d left for me inside The Fellowship of the Ring. He knew I reread that trilogy often; he knew that the day would come when I’d need the consolation of the Shire, which was as much like Bloomington, Indiana, as any place else in the world. This really does sound like an interesting book. I do love that quote in the end.